The high altitude combined with fertile soils, untainted by pesticides, enables growers to produce a high-quality crop, valued all over the world. Closer to the capital, ranks of workers operate in more laboratory-like conditions in greenhouses to produce legal medicinal marijuana, as the country tries to cash in on its booming demand. 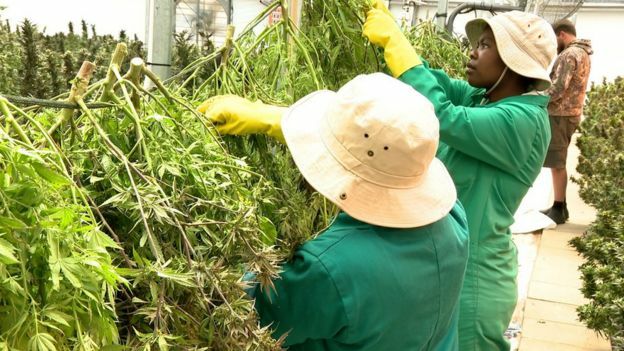 Last year, Lesotho became the first African country to legalise the cultivation of marijuana for medicinal purposes, spawning a new sector in a country where the economy struggles to create employment opportunities. But these two worlds are unlikely to meet, as the small-scale farmer cannot afford the infrastructure and licensing costs that the legal trade requires. 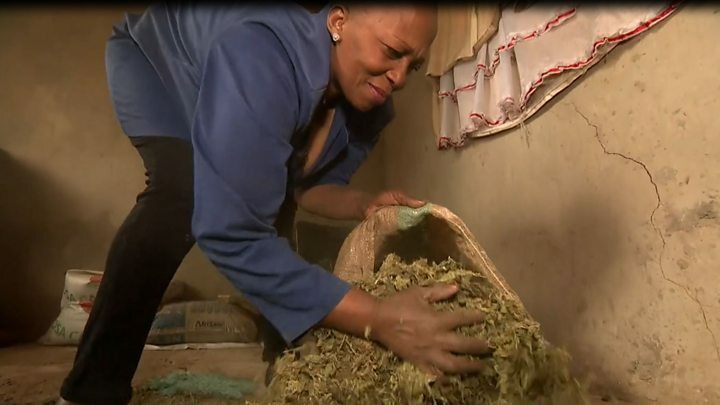 Nevertheless for Ms Thulo, who has five children, marijuana is a valuable cash crop. “This is how we earn a living… [as] the few jobs that are available are for educated people. So we rely on marijuana because we don’t have an education,” she told the BBC. Despite the lifting of the restriction on growing medicinal marijuana, what Ms Thulo does – growing it for recreational drug use – is still illegal. The new medicinal marijuana industry is set to dwarf the money that the illicit small-scale farmers earn. Globally, medicinal marijuana is big business. The market for legal marijuana is set to be worth $146bn (£114bn) a year by 2025 with medicinal marijuana set to make up more than two-thirds of that, according to consultants Grand View Research. As the first mover on the continent, Lesotho aims to capitalise on its green bounty by encouraging international investment not only in cultivation but also processing. “We want to export finished products. So the plan is to cultivate and manufacture pharmaceutical products, nutritional products, cosmetics, and extraction of active pharmaceutical ingredients,” says Masello Sello, legal adviser at the health ministry, the department responsible for issuing licences. Lesotho’s entry into the medicinal marijuana market has encouraged other countries to get involved. Zimbabwe has also legalised its cultivation and a number of other African governments are considering it as well. In South Africa, the Constitutional Court legalised the growing and smoking of marijuana for personal consumption in a landmark ruling earlier this year. 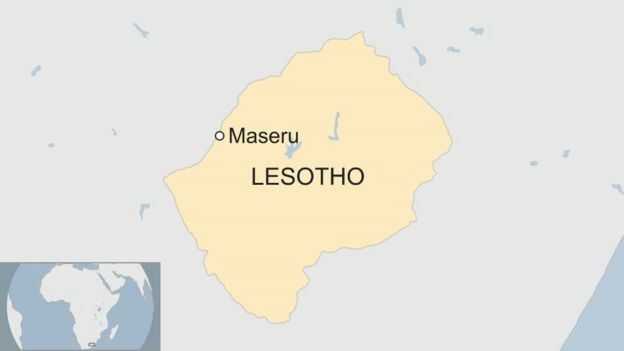 The government of Lesotho has already granted a number of international companies licences to grow, distribute and to export marijuana-based products. The country has managed to attract Canadian investors, who have found the climate and low labour costs ideal for expanding their businesses. This year, the Toronto-based Supreme Cannabis Company invested $10m into Medigrow Lesotho, giving it a 10% share of the business. 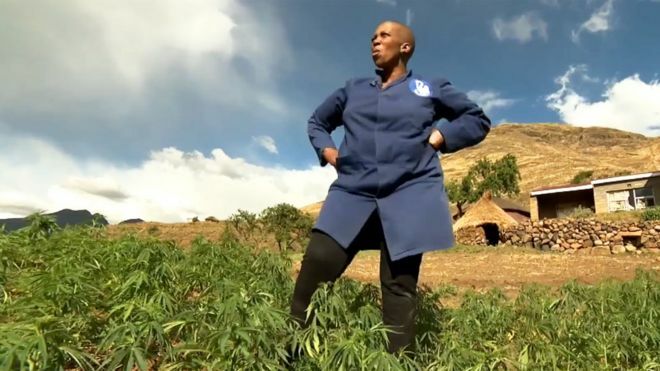 Medigrow’s sprawling medicinal marijuana farm, in Maseru’s Makarabei district, brings the hope of job opportunities to the impoverished local community. Greenhouses dot the mountainside, and the rumble of tractors and pneumatic drills reverberate as the plant nears completion. “We are already employing 400 people, and we are projected to increase our head count to about 3,000 people,” says Medigrow Chief Operating Officer Lebo Liphotho. “Traditionally the [marijuana] plant has been doing well in Lesotho, so obviously you’d want to put around a proper business structure to what has already been done naturally. Where we are, it’s also about 2,000m [6,561 ft] above sea level, which is a very good environment for the plant to produce high-quality CBD [cannabidiol] oil,” Mr Liphoto adds. CBD oil is essentially what all medicinal marijuana farmers are after. This is the compound which is extracted from the plant and then used in medicines to treat a variety of conditions. Tetrahydrocannabinol (THC) is what recreational users of marijuana are after as it is the psychoactive ingredient. All of the plants at the Medigrow farm have had THC bred out of them, Christo Moller, a grower at the facility says. “We are only after the medicine, green medicine,” he adds. 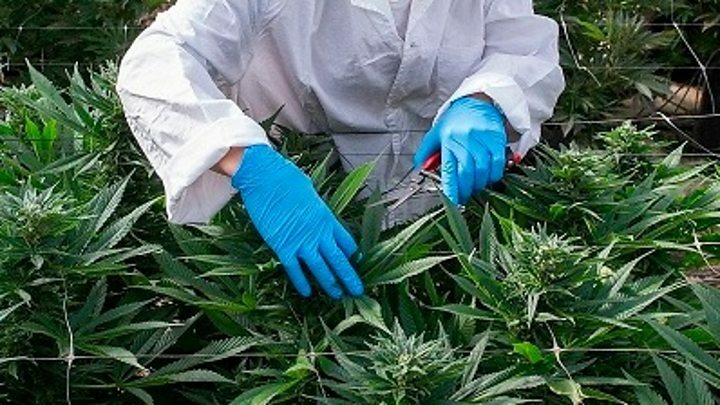 Medigrow was granted permission by the Lesotho government to begin cultivation in 2016, a year before the state legalised medicinal marijuana for all companies. In just 15 months it has made a lot of progress: it has built a road, set up communication towers and is currently applying the finishing touches to staff quarters and the CBD oil processing plant.